I can’t help but feel that the creators shot themselves in the foot with the title of this series. I can see where they got the idea from, thinking themselves clever. An anthropomorphic tale of mice set in the pulp fiction world of the 1920s (my best guesstimate) and archaeological crime. So… mice pulp…MULP. It’s a terrible name and does nothing to honour the solid story and fab artwork therein. Issue 1 sets up the story nicely. A group of mice led by Jack Redpath are working on an archaeological site when they find a tablet that has both Egyptian hieroglyphics and Greek writing on it. Clearly, it’s a find of some importance. The world in which the mice live is a curious one. Inhabited by mice (artefacts feature mice not humans) but humans have clearly been here as by the site is a huge skull, a human skull whose scale is clear next to the mice. Were we a curiosity or did we live alongside mice? A treacherous mouse called Moreau (I see what you did there), steals from the site and the chase is on. To London. 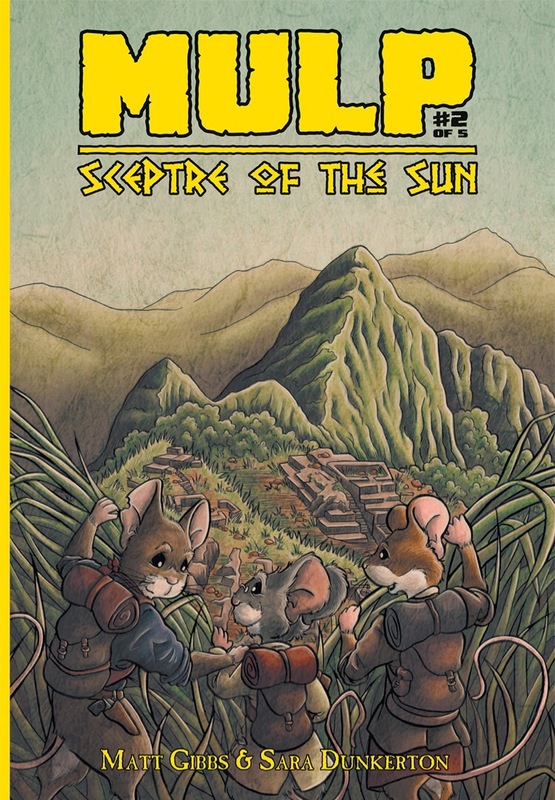 The search for the sceptre takes us to Machu Picchu in issue 2, with Moreau quick on the heels of Jack and Victoria. Of course, Moreau and Sellsey are there to intercept and they break up our heroic party. Jack is left in the Inca ruins, cold-clocked, and Victoria and the Professor are off on a plane which is, in good pulp tradition, about to crash. Will Jack come to the rescue? Will Victoria and the Professor survive? Where are we off to next? Clue – we need an ice-breaking ship. So the heady warmth of reds, golds and browns will be making way to icy whites, greys and blues. Something to look forward to. This series doesn’t necessarily tread original ground. It’s a mash up of Mouseguard and Indiana Jones. The Rescuers and Journey to the Centre of the Earth. Tom and Jerry and…well, Indiana Jones. Without Tom. Unless the true villain will be revealed as a feline. It is also incredibly detailed, both in terms of the artwork and the story / dialogue. It pretty much demands re-reading. The tale features astrology, mythology, history, sociology, puzzles, intrigue, betrayal… there is much to take in. The artwork is superb on the whole. Muted colours, 1920s styling, shadows and light – it’s pretty, nearly perfect. The mice are also fab: filled with personality, expression and detail. Props likewise. The landscapes are a little flat, a little hurried – almost as if the creators want you to focus on the mice, which is occasionally hard to do when they themselves comment on the view. You get a little treat at the end of each issue with some pages of pencil sketches which show just how talented the creators are. It’s not my kind of story, too refined, but that’s my loss. Older children will enjoy it. Fans of Indiana Jones type adventures will love it. Fans of Mouseguard will compare it. But MULP promises much adventure and delivers it. You’ll be like the cat that got the cream. Thankfully, this is one comic that doesn’t live up to it’s name. You can find out more about MULP: Sceptre Of The Sun on the Official MULP website, including where to buy a copy.